Jack Marshall Gardo, 87, of Greenville, husband of Guynell Smith Gardo, died Wednesday, November 27, 2013. Born in Laurens County, he was the son of the late Carl Christopher and Addie Huggins Gardo. Mr. Gardo served in the US Navy during WWII. Jack was the last surviving member of the crew that rescued JFK from an island in the Pacific Ocean after his boat was destroyed by the Japanese. He was the owner and operator of Greenville Terrazzo since 1958, retiring in 2007 and serving as past President of the SE Territory of the Terrazzo Company. Jack was a member of Berea First Baptist Church. He served as past President of Greenville Shriners Club, past Potentate of Hejaz Shriners, past President of The South Atlantic Shrine Association and a member of Monaghan Masonic Lodge 251. He was a loving husband and father who loved to garden and had a green thumb. In addition to his loving wife of 62 years, he is survived by son, Guy B. Gardo and wife, Brenda; daughter, Jan L. Gardo; granddaughter, Krystal F. Gardo and husband, Shelton Pace; and two great grandsons. He was preceded in death by a daughter, Jackie Nell Gardo. Visitation will be held Sunday, December 1, 2013 from 5:00 p.m. until 7:00 p.m. at Thomas McAfee Funeral Home, Northwest. The funeral service will be held Monday, December 2, 2013 at 10:30 a.m. in the Northwest Chapel. Entombment will follow in Woodlawn Memorial Park. 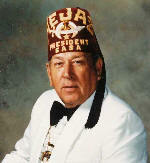 Memorials may be made to Shriners Hospital for Children, 950 West Faris Road, Greenville, SC 29605. The family will be at the residence.